Behold. 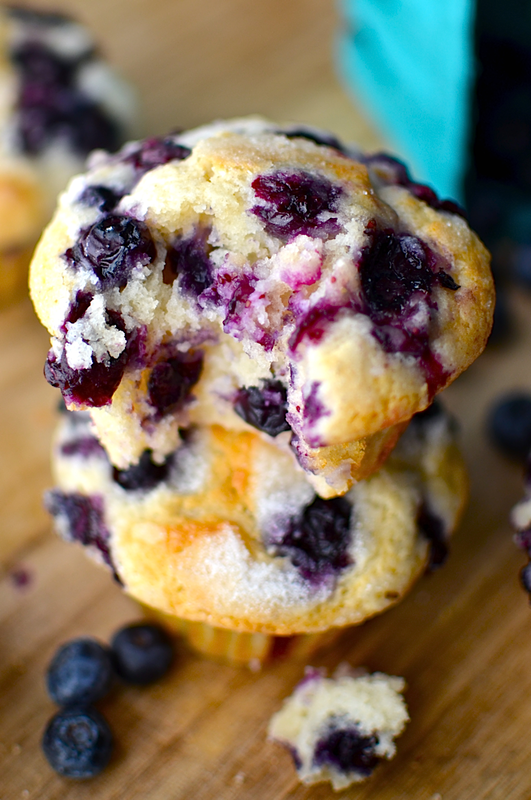 The perfect blueberry muffin. After weeks of experimentation and tweaking, it's finally here. It is moist and fluffy, just as I dreamed it would be. It has the tall, perfectly cracked crown, sparkling with sugar. It even passed the squishy test, the perfect pillowy softness when lightly squeezed. Plus, it only dirties one bowl. If any of you are frequent readers, you know that I speak the truth that I've been on this muffin kick for a while. And if you follow on Instagram, you have seen first hand a small sampling of the ridiculous amount of muffins I have made during The Great Muffin Experiment of 2015. My sister Nemo and I have made such an obscene amount of muffins in the last couple weeks. It's really all a blur. I don't remember how it even started. Every day I would make multiple mini batches of muffins. I would only make two at a time, measuring out tablespoons of eggs so that I could bake just two at a time. Then we would let them cool, carefully dissect them, take notes, and then start all over again. On Monday, I came home from work and asked my sister if she had made any muffins while I was gone. I had gotten antsy sitting at my desk all day, daydreaming about The Great Muffin Experiment. I looked at her notes and made new adjustments and made another batch before I went to bed. On Tuesday, I was becoming discouraged. So many muffins. So many variables. Would we even recognize the perfect one now if we saw it? "Listen, Yammie," said my wise, older sister, "All of the muffins we have made so far are better than any I've ever had. We can't give up now though, so close to the end. 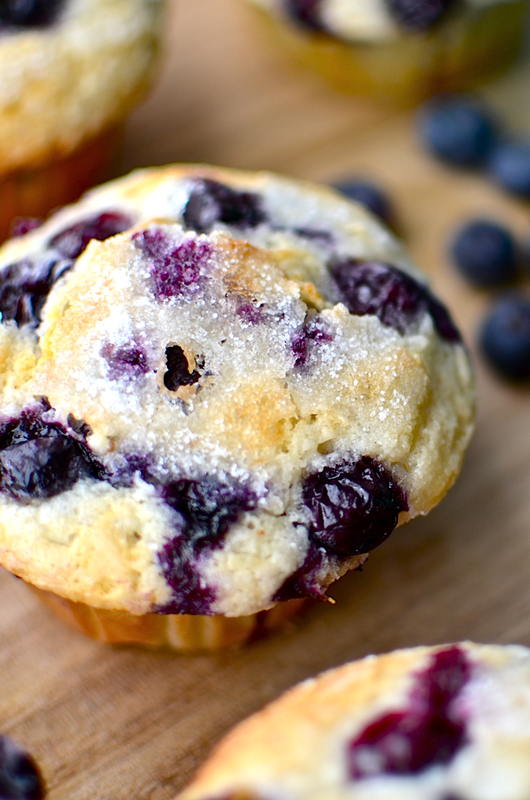 The perfect muffin is now within our reach. We will know it when we see it." On Wednesday, we finally achieved our goal. I baked the full batch at long last. Later that day, Nemo texted me a picture of the muffins at Starbucks and said, "We win." I suppose I should record here a few of our findings from The Great Muffin Experiment, even though now that I have this awesome recipe, I won't have to think about this stuff EVER AGAIN. 1. 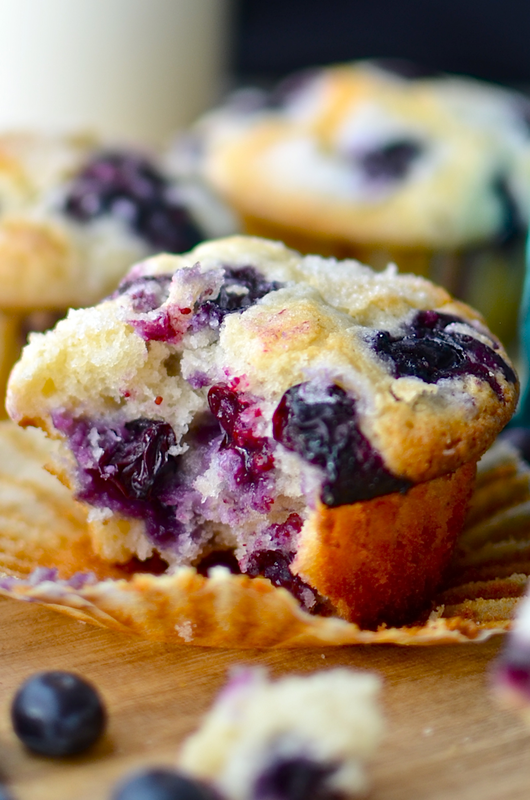 Sugar- If you've ever made muffins that have sunken in the middle and have a chewy top around the edge, too much sugar is most likely the culprit. Not enough sugar and, well... they won't be sweet. 2. Flour- Too much flour and muffins will be too dense. 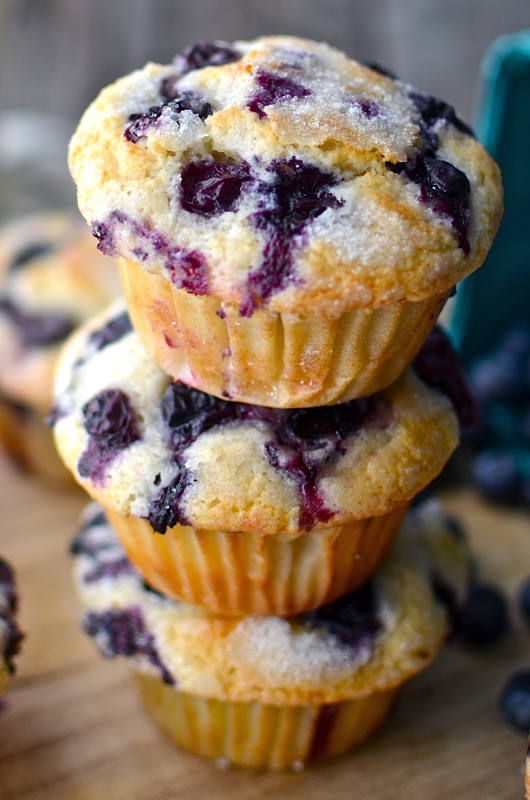 Adding more flour can also help add some height to your muffin though. 3. Oil- Adding too much oil will make a greasy muffin. 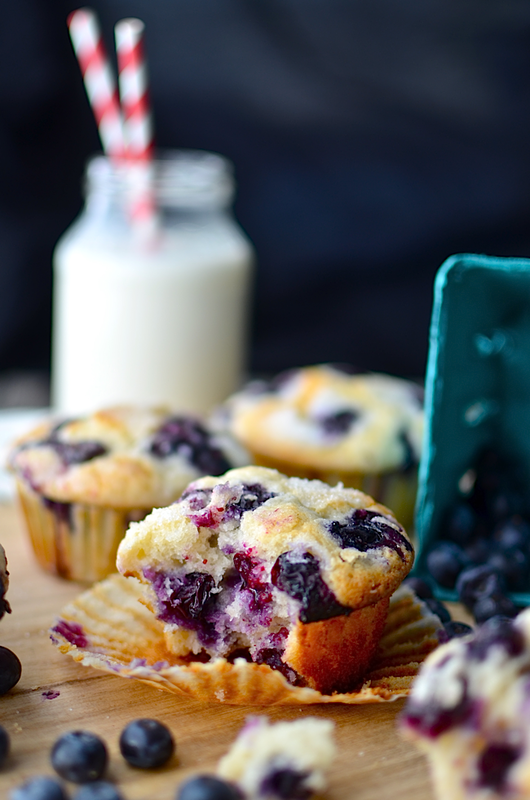 Oil stays liquid at room temp which means that it keeps your muffin moist, so make sure you have enough. 4. Baking powder- Don't think you can just add more baking powder to make your muffins taller. If the batter isn't thick enough, it will just cause them to spread so you have wide, flat-topped muffins. 5. Sour Cream- Sour cream enhances the texture of the muffin and also adds flavor. Adding sour cream helps to add thickness to the batter without having to add extra flour. You can also use yogurt for the same effect. 6. Temperatures- The temperature affects the rise and bake time of the muffin. Baking at 400ºF will give your muffin a good rise so you'll have nice tall muffins, but they might get too brown. Baking at 350ºF will give you shorter muffins that don't brown. We liked 375ºF the best for tall, golden brown muffins. 7. The Blueberries- Fresh blueberries are, of course, the best. You can use frozen though too, which is what I did for all of the experimentation. 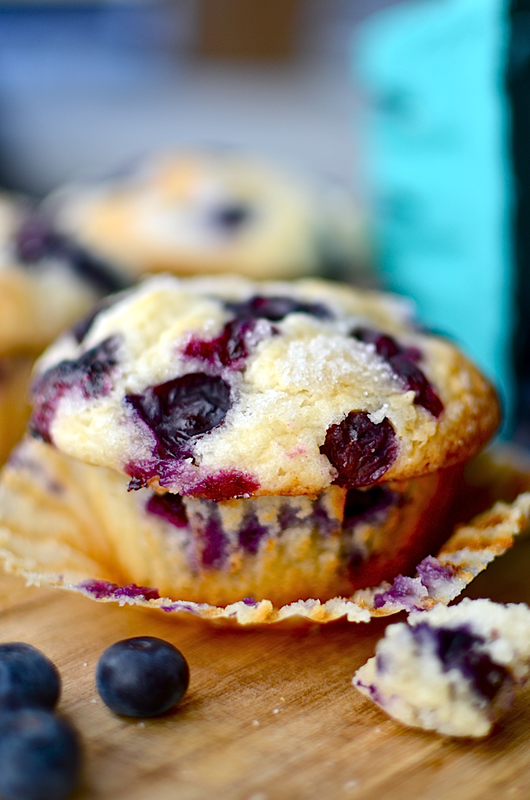 Frozen blueberries will increase bake time and may reduce the rise of the the muffin. I like to reserve some of the berries to press into the tops so they're visisble. 8. Filling the tin- If your batter is thick enough, you should be able to fill the muffin tin to the very top. As the muffin rises, it will produce a tall crown that creeps over the edges, creating that familiar muffin top that we know and love. If your batter is too thin and you attempt to fill the muffin all the way, it will just run all over the place and will stick to the pan. Preheat oven to 375ºF. You may want to lightly grease your muffin tin so that the crown of the muffin doesn't stick to the pan (I didn't though). Place eight muffin liners in the pan. Combine the sugar, egg, oil, milk, and vanilla in a bowl and stir until well combined. Add the flour, baking powder and salt. I stir the baking powder and salt into the flour right on top of the wet ingredients so I don't have to get out another bowl. Once the baking powder and salt are pretty well distributed in the flour, stir them into the wet ingredients until combined. Don't overmix. Just stir until it's no longer lumpy. Stir in the sour cream just until well distributed. Fold in the blueberries (I left about half for the top so some would be visible on the crown of the muffin). Evenly distribute the batter in the muffin tin. 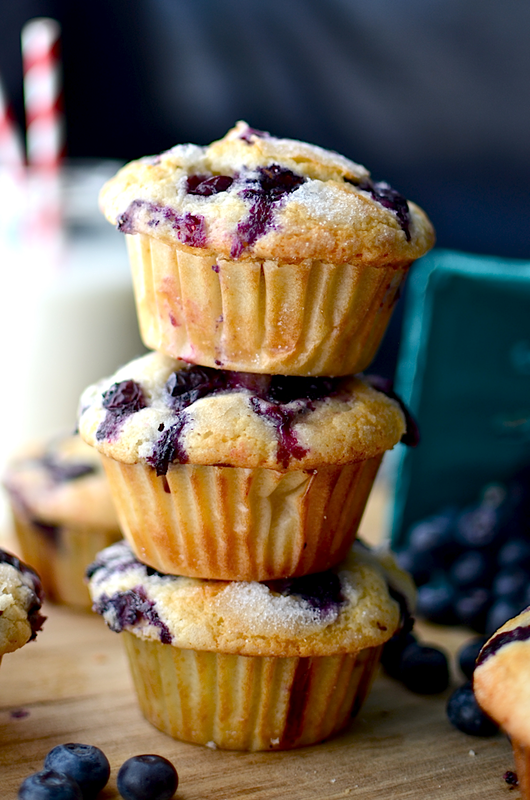 If you are making 8 high crowned muffins, you will be filling them all the way to the top. If you want to make shorter muffins you could probably fill 12. If you saved some berries for the top, sprinkle them on and press them in lightly. Sprinkle the tops with the 1 tablespoon of sugar if you want. Bake muffins for about 25 minutes. If you're using frozen berries it will take about 5 minutes longer. Also depending on how many muffins you decided to make, it will also take a shorter time. Just make sure you get them out as soon as a toothpick comes out clean. 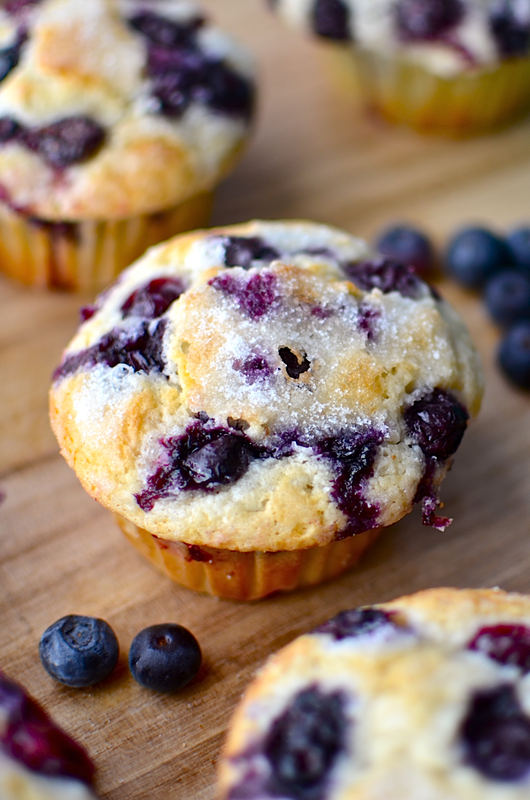 You can also make maybe 3 or 4 giant muffins in a jumbo muffin tin. If you do, bake them at 350ºF for maybe about 40 minutes. I like to put them in a sealed container while they're still warm so the stay really moist. That's assuming they aren't eaten right out of the pan though. P.S. Get the STRAWBERRY version here. Don't forget to follow Yammie's Noshery on Facebook, Twitter, Pinterest, and Instagram! Or enter your email address in the top right hand sidebar to receive posts by email!